Like every other '90s kid, I was obsessed with Boy Meets World, which is why I was beyond excited for the show's spinoff sitcom, Girl Meets World. Girl Meets World , which premiered on Disney Channel earlier this summer, follows Original Boy (and now father) Cory, his soulmate/now-wife Topanga, and their two kids, "New Girl" Riley and Auggie, as they navigate their lives in New York City. Cory is now a teacher, following in the footsteps of the beloved Mr. Feeny. Feeny himself makes an appearance at the end of the pilot episode — Cory "sees" Feeny in the subway station after giving his daughter some choice words of advice. It's meant to be a sort-of "passing the torch" moment, where Cory has become the new Feeny — officially stepping into the role of mentor, rather than mentee. However, this scene led many fans to assume the worst — that the vision of Mr. Feeny was a sign that Feeny was a ghost — a.k.a. dead. Yikes. Though writer Mark Blutman took to Twitter to clear up the confusion (in all fairness, it was a little confusing) that doesn't mean that Ghost Feeny is a necessarily terrible idea. Don't get me wrong here — Feeny was the ultimate television mentor, and his sage advice not only helped out Cory, but helped viewers gain some perspective on their own lives. (Come on — like you haven't applied a Feeny-ism to a particularly challenging part of your life.) In fact, it's because Feeny was such an awesome mentor and strong character that I think his character could continue to have an impact on Cory and company long after Feeny died. For all we know, Mr. Feeny is still residing in Philadelphia, mere hours away from the New York City home of Girl Meets World. Sure, it's a train ride away, but it's not like Feeny can always be there to give Cory advice whenever he needs it. And really, should he? Feeny's given Cory all that he can in terms of advice — he's been a guide for Cory for almost his entire life. However, if Feeny were, to, say, have died several years earlier, Cory would have to rely on the memories of Feeny — and his own confidence that he's doing the right thing. Cory could imagine what Feeny would do in particular situations (perhaps with Feeny's "ghost" occasionally popping up to talk it out) but, ultimately, would be the one in the mentor's shoes. Feeny doesn't necessarily have to die for this to happen, but the fact remains that Feeny doesn't have the same place in Cory's life anymore. For Feeny to physically "move on," the show would be illustrating a change in generations — a passing of the torch from Feeny to Cory. 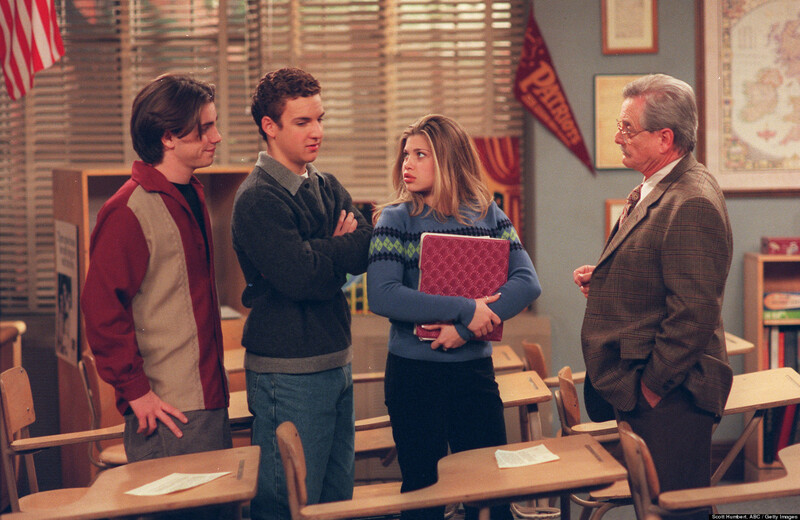 We won't ever really "lose" Mr. Feeny — he'll always be in Cory and his friend's hearts and in the wisdom they pass along to the next generation of "students." Though it doesn't seem that Feeny is really gone, his physical absence in general signifies the changing times. That's not a bad thing — that's just how life goes. I think Feeny would say the same.